In the world of immersive health, partnerships play a big role in hospital-wide adoption. This is very visible in the partnership announced in 2017 between virtual reality company Oculus and Children’s Hospital Los Angeles (CHLA). The partnership entails virtual reality software that presents pediatric emergency simulations built to efficiently train clinicians and staff in emergencies that might be difficult to otherwise simulate. The results of the 2017 pilot program were very positive. And today, CHLA has started to require immersive health training using virtual reality for all incoming residents. It’s also offered as a supplemental training method for existing clinicians. The program has been expanded to 11 more medical institutions and healthcare networks, and Oculus has donated Oculus Go headsets to make it easier to run the simulations. The participating institutions are Columbia University Irving Medical Center, Johns Hopkins Children’s Center, Kaiser Permanente Health Network Southern California, Medical University of Vienna, New York University/Langone Medical Center, Stanford University/Lucile Packard Children’s Hospital, University of Bern, University of Washington and Yale New Haven Health. Oculus Go is a stand-alone headset that will enable CHLA training expansion. While real-world simulations can be created with adults actors, simulating them with children is a very different matter. It’s just not feasible with kids, and using artificial patients (dummies, for example) just doesn’t simulate the situation in quite the same way that a live patient or virtual reality simulation can. 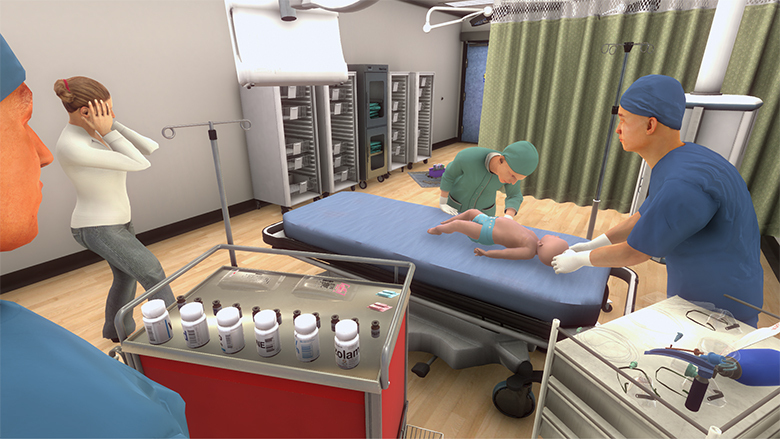 The virtual reality simulations are presented in full 3D and are available via CHLA and its affiliates. It is a groundbreaking use of the Oculus Go headset to bring VR medical training to the forefront of medicine.